Aguada beach is the perfect spot if you look out for sand, surf and sun and it is situated in North Goa. Aguada varies from other beaches present in Goa due to its great forts and historical attractions, apart from the sand and the sun. Aguada beach is a very famous beach in Goa with its ramparts facing Sinquerim beach. Its Fort along with the lighthouse was constructed in the year 1612 for security from the Dutch and Marathas and is well-preserved. The many unspoiled beaches with the backdrop of ancient citadels are favourites among visitors. Thousands gather here to enjoy the historic beauty of these citadels and the warm sun. During historical times, this centuries-old Portuguese fort was the main reference point for the vessels arriving from Europe. This fort is located on the south beach from Candolim, on the shore of the Mandovi River. This fort was primarily in charge of shipping defence and the defence of Bardez, its nearby sub district. The fort was highly prized and a very significant fort of the Portuguese. This fort is very large and envelops the whole peninsula till the south-west border of Bardez. The fort has been strategically built on the river Mandovi’s mouth, for chief defence from the Marathas and the Dutch. During the period of Salazar Administration, the Fort Aguada had been repurposed to be used as a jail; some claim it was mainly for the political opponents of Salazar. Now, most of the inmates here are Western tourist people serving imprisonment time due to drug-related crimes. In ancient period, this fort was the major storage place of freshwater having 79 cannons with the storage capacity for 2,376,000 gallons. It was among the largest freshwater storage area of that time in entire Asia. The fort was separated into two segments with the upper segment as fort plus watering station, and the lower segment as a secure compartment for Portuguese vessels. While the upper segment had a gunpowder room, bastions, lighthouse, moat and water storage place underground, it also had a secret escaping passageway for use during times of emergency and war. The lighthouse initially used to emanate light once every 7 minutes, which was changed in 1834 to release light creating an eclipse once in 30 seconds, but then abandoned in the year 1976. The name obtained by the fort, ‘Aguada’ means ‘Water’ because of a freshwater spring within the fort that used to supply water for all the ships stopping by. So, crews of the various ships that passed by visited this fort frequently to replenish the freshwater supply of their ships. A four-storeyed large Portuguese lighthouse constructed in 1864 stands on this fort and it has the pride of being the oldest lighthouse in Asia. Fort Aguada is truly an amazing man made historical structure and from its top part, you can obtain an excellent view of the sea. Everything about the Fort is likeable and it is one ideal spot where you can enjoy a marvellous beach-view from a great height and the sea breeze hitting your face would be simply wonderful. The beach is even more special because of the fort which the Portuguese constructed to prevent the enemies from entering into the River Mandovi as well as to safeguard Goa from other attacks. So, this fort is a must visit to relish the nostalgic reminders of the regime of the Portuguese, especially the Lighthouse prison. Aguada beach is often visited by a huge crowd of tourists and the Fort Aguada soothes the eyes by offering marvellous views of the beach. Apart from the magnificent views of the beach and the sea, there are plenty of famous and interesting churches here, which are worth visiting. Also, from the fort’s ramparts, you can catch an incredible view of all the beautiful Golden beaches which run right till Maharashtra’s borders. 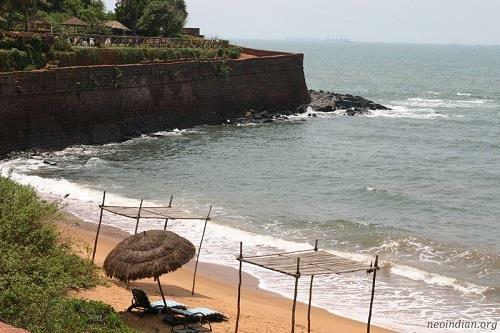 The beach is often identified with a superb top-notch hotel nearby, the ‘Fort Aguada Hotel complex’ that is located on the top of a cliff, surrounding the 17th century old Portuguese fort’s remnants. Though you cannot access the beach from the grounds of the hotel since it is private, you can very well walk along the beach and enjoy the view, for there are no private beaches in India. This famous hotel has cottages built on the hill’s upper parts and offers splendid views of the fort overlooking the sea as well as the fantastic Goan village consisting of individual cottages. The hotel was built as three parts, the first part with expensive cottages situated on the hill’s upper reaches, the second part showing the fort protruding over the sea, plus the third part providing a delightful view of Goan village and its individual cottages. water sports varieties and travelling vendors of almost everything starting from Kashmir carpets to soothing massages. 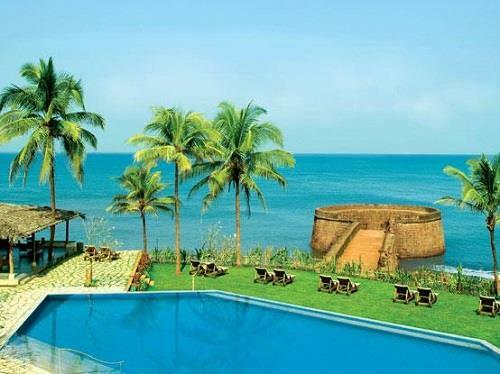 The Fort Aguada Beach Resort is a popular five-star luxury hotel, which is the own property of the Tatas. It belongs to an 88 acre (3, 60,000 m2) complex located on the Sinquerim Beach and overlooks the Arabian Sea. This is a family-friendly beachside 5-star resort located in Panaji, on the shore of the beach where both the Arabian Sea and River Mandovi meet. Goa Marriott Resort & Spa is at a walk able distance of just 5 minutes from Goa's capital, downtown Panaji. Miramar is another beach situated at a distance of 4 miles (7km) away from Panaji. This luxurious resort has an infinity pool overlooking the river as well as a comfortable swim-up bar. Visitors can sit and have relaxation time in the casino, 24/7 fitness center, landscaped gardens or spa or enjoy food from the four good restaurants inside. Wireless Internet facility is also available inside the resort.